There are some spirits that refuse to move on after death. Some choose to roam Earth to exist amongst the living. Others opt to attach themselves to an object, such as a painting or item of jewellery. 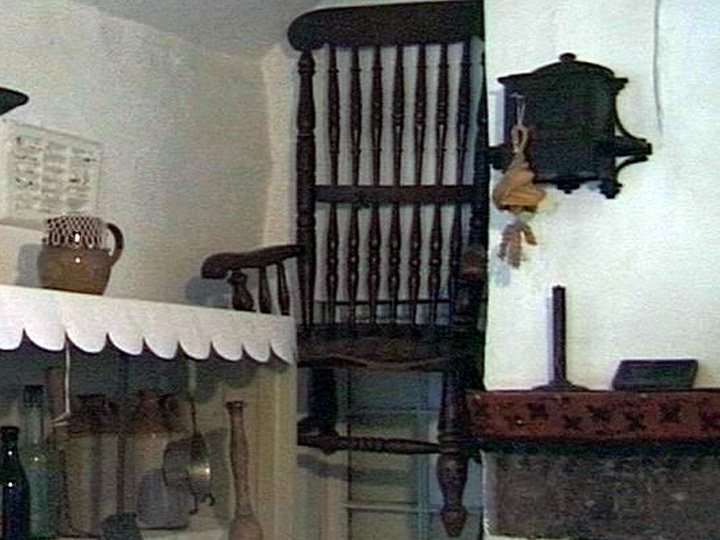 Here are 10 of the most haunted objects in the world. “The Hands Resist Him” is now considered one of the most haunted works of art in the world, and was sold by an anonymous eBay seller back in 2000. 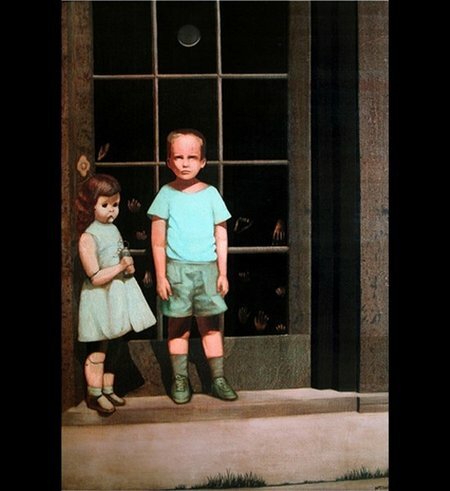 It was created by artist Bill Stoneham in 1972, and features a young boy and a creepy doll standing in front of a glass door. 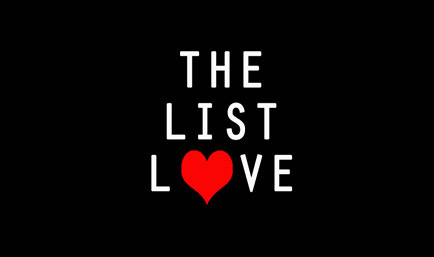 It was first purchased by John Marley, a Hollywood actor, before being sold to a Californian couple. It was sold on eBay with a warning that the painting brought with it many problems. The couple who bought the painting reported the figures would move around at night, and would also completely disappear from the canvas. What’s even scarier is that the boy in the painting was claimed to have actually entered the room where the painting hung, and everyone who ever viewed the painting later felt sick and weak. Many small children could not bear to look at the painting, forcing them to run from the room screaming. Many adults also stated they felt as though unseen hands were grabbing them, whilst others felt they had been blasted with hot air, as if they had just opened an oven door. People who viewed the painting online claimed to have felt a sense of terror, dread or unease. The painting was purchased by an art gallery in Grand Rapid, MI. According to the gallery, the two people who originally displayed and reviewed the painting died within a year of its viewing. The story of the Annabelle doll has recently hit cinemas across the world, and is sure to give everyone who watches it a fright this Halloween. You will most definitely be scared of the movie when you learn that it is actually based on a true story. Back in 1970, a woman bought the Raddedy-Anne style doll from a thrift store for her daughter, who was in college. Her daughter loved it so much that she kept it in her apartment, but it didn’t take long for her and her roommate to realise odd things were happening that involved the doll. The doll would often move by herself, as she would find it in another room, even though they both had not touched it. Small scraps of parchment paper, that neither girl owned, were also found with childish handwriting scrawled on them. Both women one day returned home to find the doll was standing, rather impossibly, on her own legs. Obviously scared by the doll, they contacted a psychic medium, who told them the doll was possessed by the spirit of a young girl known as Annabelle. She had died in the apartment building and liked the college girls so much that she wanted to stay with them, and so they allowed the spirit to remain in their apartment. As the spirit of the young girl was accepted, the paranormal activity levels increased, and one night the doll attacked a male friend, leaving vicious scratch marks across his torso and chest. Frightened by the paranormal events, the girls contacted the respected psychic investigators Ed and Lorraine Warren. The married experts stated the doll was not possessed by the spirit of a child at all, and was actually possessed by a demon who had lied about its identity to become closer to the girls. 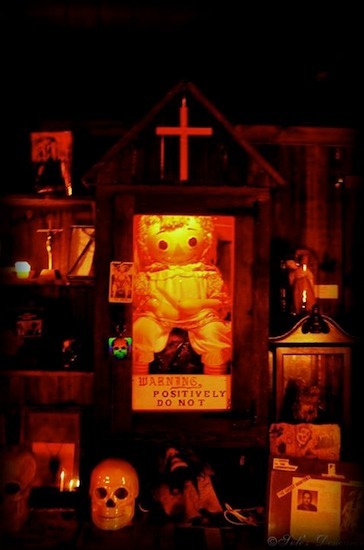 The girls gave the Annabelle doll to the Warrens, who encased it in a glass display cabinet at their Occult Museum in Conneticut. The glass cabinet bears the sign, “Warning: Positively Do Not Open”. In 1849, Anna Baker fell in love with a low class iron worker, who did not meet the standard of her rich family. Her father, Ellis Baker, refused his daughter to marry the man, forcing her into a lifetime of spinsterhood, as she never fell in love again. She remained bitter and angry until her death in 1914, and never got to wear her beautiful wedding dress to the man of her dreams. As there was no marriage on the cards for Anna, her dress was sold to a local family, and so Elizabeth Dysart wore the dress to her own wedding. The wedding dress was donated to the historical society, and later became part of the Baker mansion that was turned into a museum. The wedding dress was preserved in a glass case for exhibition in Anna’s former bedroom. 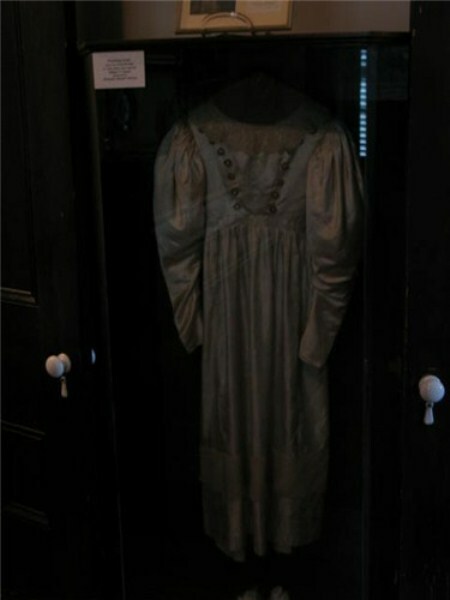 Following her death, many of the visitors claimed the dress would move on its own, especially during a full moon. The dress would sway from side-to-side, as if she was admiring it in a mirror. 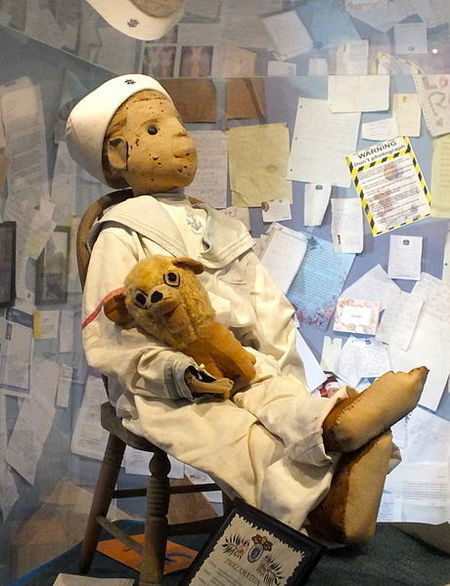 Robert Eugene Otto – who was often called Gene – was just four years old when he was given a doll, which was dressed as a sailor, as a gift from his parents. Gene decided to call the doll Robert. From the moment the doll entered the family home, odd events occurred. Gene’s parents often heard their son giggling with someone, who they claimed had a deep-sounding voice, and if they walked by the room they would find overturned furniture where Robert was sat. Gene also claimed to have many terrible nightmares, and toys would reappear mutilated. Whenever something went wrong within the home, Gene would often mutter “Robert did it”, resulting in his parents banishing the doll to the attic. The spooky events did not stop there, as many passersby often claimed to see a small figure moving from window to window. The doll can now be visited at Key West’s Fort East Martello Museum, but you must ask the doll’s permission to take his picture, as he does not enjoy unsolicited photographs. It is also strongly advised you do not – under any circumstances – bring a Robert the Doll replica. 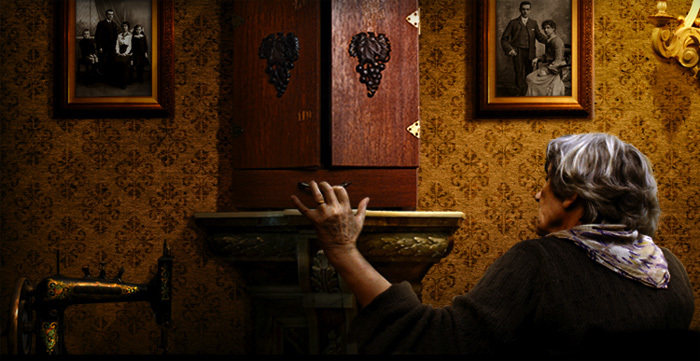 You may have heard of The Dybbuk Box if you have seen the 2012 movie The Possession. It was based on the real item, which first made an appearance on eBay in 2003. The owner of the box intended to use it to store wine, and had bought it from a Jewish women who lived to the age of 103. She warned the owner that the box housed a dybbuk – an evil spirit – and that it should never be opened. The new owner, however, ignored the lady’s warnings and opened the box, and strange and tragic events occurred soon after. He gave the box to his mother, who immediately suffered from a stroke. He later gave the box to his sister, who was freaked out when the box refused to shut. The owner sold the box but it was soon returned to his doorstep, and included a note that read “This has a bad darkness”. The box has changed owners many times since its first auction in 2003. There is a good chance you have seen The Crying Boy before. It has adorned the walls of many homes across the world since it was first widely distributed in the 1950s. 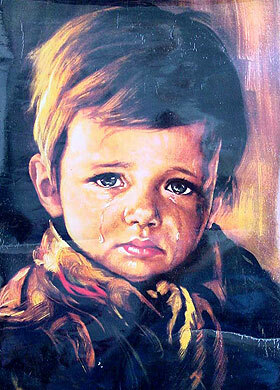 In 1985, many stories emerged that The Crying Boy prints had been found in the ruins of homes that were burnt to the ground. Many firemen refused to have the image in their home. It was later discovered that the painting included a varnished coating in the print that was a fire repellent, but many still believe the painting is evil and should not be hung in the home. 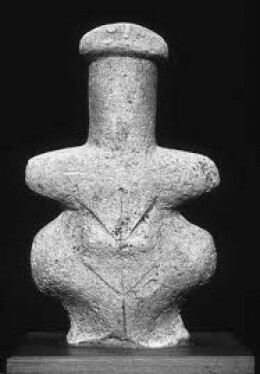 The Women from Lemb statue, often nicknamed “The Goddess of Death”, was discovered in Lemb, Cyprus, in 1878 and dates back to 3500 B.C. The statue is believed to represent a goddess, which is to be similar to a fertility idol. Upon its discovery, the statue was owned by Lord Elphont, and all seven of the Elphont family members died from mysterious causes within 6 years of its possession. The next owners, Ivor Manucci and Lord Thompson-Noel, along with their entire families, died just a few years after purchasing the statue. The fourth owner, Sir Alan Biverbrook, along with his wife and two daughters, died after possessing the statue. His sons, however, survived and decided to sell the statue to the Royal Scottish Museum in Edinburgh, where it remains to this very day. The statue, however, did bring bad luck to the museum, as the chief of the section where the statue was exhibited died suddenly. No museum worker has since handled the statue, and it is stored safely under glass to be protected from human contact. 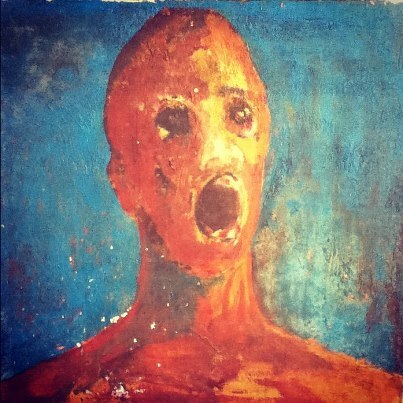 The painting of The Anguished Man remained in Sean Robinson’s grandmother’s attic for 25 years before he inherited it. She had always warned her grandson that the painting was evil, telling him the story of how the artist mixed his own blood with the paint before committing suicide. She claimed to have often heard voices and crying whenever the painting was displayed, and that she had seen a shadowy figure of a man inside her house, and so locked it away in the attic. When the painting was placed in Sean Robinson’s home, he soon learnt his grandmother was telling the truth, as his son fell down the stairs, his wife would often feel someone stroking her hair, and they had seen the shadow of a man who could be heard crying. The painting still dwells in Sean Robinson’s attic, and he has shown no interest in selling it. In 1702, Thomas Busby, a convicted murderer, was to be hanged for his crimes. His last request was to have a final meal served at a pub in Thirsk, England. Once he finished his meal, he stood up and reportedly said, “May sudden death come to anyone who dare sit in my chair”. Despite his curse, the chair remained in the pub for many years, with many punters daring one another to sit on it. During the Second World War, many of the locals noticed that any soldiers that sat in the chair never returned from the war. In 1967, two RAF pilots bravely sat in the chair and walked out of the pub with their lives, but crashed into a tree as soon as they left. Undeterred by the mysterious deaths three years previously, a mason sat in the seat, only to die that afternoon by falling into a hole at his job site. Just one year later, a roofer sat in the chair and died after falling from a collapsed roof. The pub’s cleaning lady also once tripped and fell into the chair. She died a little later from a brain tumour. These are just some of the many stories surrounding the chair, and the pub’s owner moved the chair to the basement. However, the chair claimed another life whilst in storage, as a delivery man took a rest in the chair when unloading stock, and was killed in a car accident later that day. Aware of how dangerous the chair was, the owner donated it to a local museum in 1972, and it is displayed five feet in the air so no-one will ever make the same mistake. 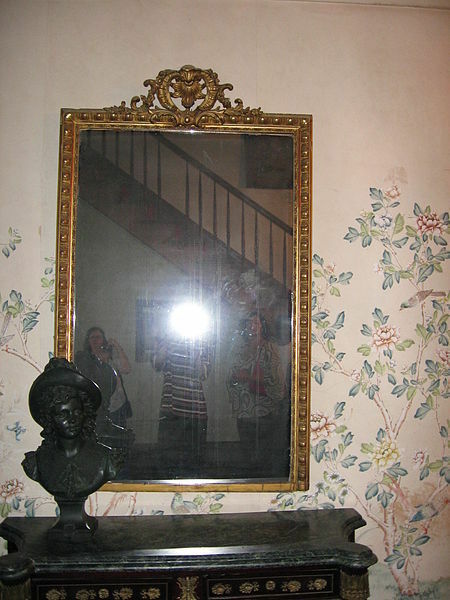 Myrtles Plantation is thought to be the most haunted home in the United States, and is also the dwelling of The Myrtles Plantation Mirror. The plantation was built on a Native American burial ground in 1796, and is also rumoured to be the location of up to at least 10 murders. The mirror was added to the home back in 1980, and guests have reportedly seen figures lurking in the mirror, as well as noticing child-sized handprints on the glass. Legend has it that the mirror contains the spirits of Sara Woodruff and her children, who were poisoned to death. Custom dictates that all mirrors should be covered following the event of a death, but this mirror was not, and so the Woodruff family now live in the mirror. Like to feel a bit spooked out? Why not be a glutton for punishment and read 10 of the Most Frightening Places on Earth.